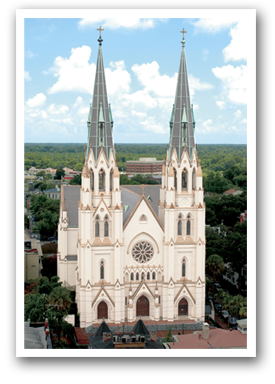 The Savannah Diocesan Council of Catholic Women is comprised of 7 Deaneries with 31 affiliated Catholic women's organizations in parishes throughout the Savannah Diocese. The Deaneries are: Savannah, Augusta, Valdosta-Brunswick, Macon, Columbus, Albany and Statesboro. Our affiliates, through their time, talent and stewardship, support the National Council of Catholic Women (NCCW). 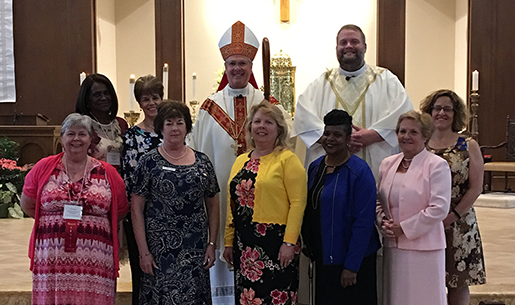 The Savannah Diocesan Council of Catholic Women (SDCCW) celebrated its 79th anniversary hosted by the Albany Deanery in Richmond Hill, GA.
Fr. David Koetter, SDCCW Spiritual Advisor, is standing next to Bishop Gregory J. Hartmayer. Not pictured: Debby Stepian - Albany Deanery President.